for your staff on the topic(s) of your choice in a conference format. If your preferred topic is not listed, please contact us to explain your training needs. 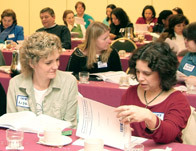 We will work to personalize a conference specific to your goals. Submit your request online to receive your free quote. Your On-Site Training Specialist will respond to your request within 1-2 business days. Please call us toll-free at (877) 857-8964 to speak with your On-Site Training Specialist. I am brimming with pride over a very successful staff development day for almost 300 teachers. From the presenters to the BER staff, it was a job well done. I have organized conferences before and have been very exhausted. You took the worry and the hassle out of it. I will recommend BER to everyone! .